Got weaving problems? 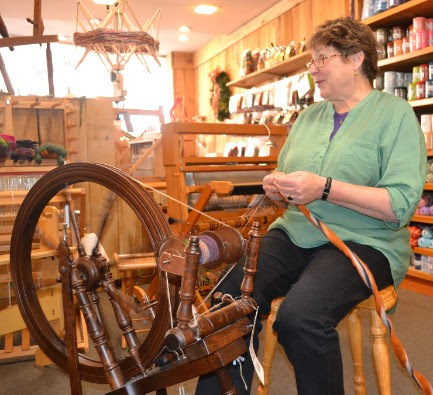 Stumped by your spinning? Our resident expert Nancy Reid will answer all of your burning questions in this new regular feature! Previously only available on our newsletter, we are moving Nancy's informative column over to the Woolery blog for easy reference. In this month's edition, we are sharing a few questions about reeds sent to us by new weavers. To ask your own question, email weavernancy@woolery.com or click here to post your questions in our Ravelry group! Q: How do I find a reed to fit my specific brand of loom? A: Most looms are pretty generic in their demand for reeds; the top batten sley (the top of the beater/reed holder) usually rides in vertical slots, allowing for some height adjustment for the “tall” of the reed. Most looms will take 4” to 5 1/2” of reed with no difficulty at all; you can measure your beater to confirm that. Standard reeds today are 4 3/4” or 5” tall, and as long as your beater will accommodate that, you are fine ordering a standard reed. If not, we can always do custom. As far as width goes, at 42” of weaving width (the way reeds are ordered), the actual width will be 43”. 42” is not a stock size, so you can order a 45” reed, and we can cut it down for you, or you can do it yourself with a hacksaw. Modern reeds are securely epoxied down the length of the top & bottom rails, so they can be cut without falling apart. Q: I am new to weaving and am wondering what size reed is recommended for using 8/2 cotton on a floor loom? My used loom came with several reeds, but the dents look rather large and the size not indicated on reed frame. Help! A: Talk about lobbing easy shots! This one is simplicity itself; to figure out what dent size reed you have, lay a ruler on it and count the spaces; 10 spaces per inch is 10 dent, 8 spaces is 8 dent, and so forth. 8/2 cotton (usually) takes a 10-dent reed, double-dented for a net EPI (ends per inch) of 20 for a plain weave structure. In a twill, the usual sett for 8/2 is 24 EPI, so doubled in a 12-dent is normal. Depending on which reeds you have (and your budget for buying more reeds), you might need the aid of a reed conversion chart to get the sett you need out of the reeds you have; there’s one in the back of nearly every weaving text (p. 210 in Chandler), or on our website, found here. Please note also that there are just 2 answers to every weaving question, “it depends,” and “always make a sample;” the numbers given above are pretty average setts for something of the drape qualities and density for dishtowels of blouse material; you’ll want a firmer sett for upholstery and a looser sett for curtains (maybe).